This Presentation date is September 20, 2018 at 11:00-12:00 local time. 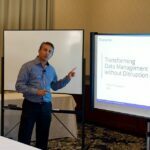 Mike Peercy, Founder and CTO, and Kumar Goswami, Founder and CEO, provide a product deep dive to explain the technical foundation of the Komprise Software solution. This includes a whiteboard map of the general architecture.